Text in English, French & German. This book is a highlight for all fans of tattoo, and Japan as well! Photographer Martin Hladik attended the Japanese tattoo master Horikazu with his camera for years, and he presents now the lifework of a remarkable tattoo artist in spectacular images. With this book, comprising scant 500 pages with more than 460 pictures you are diving into the still hidden world of traditional Japanese tattooing. Interviews with the late master (2011) and his successor Horikazuwaka provide virtually intimate insights into the art of tattooing in Asakusa, and give a glance of the protagonists of a recognised dynasty of tattoo artists. Functioning and techniques of this handicraft are shown in-depth. Furthermore you will experience the fascinating aesthetics, and the complex conception of motifs in traditional Japanese tattoos displayed in gorgeous photographs, from Koi to Kabuki, from Buddha to Benzaiten. Anyone of the tattoos reproduced is one of a kind, it was exclusively created for the wearer, and made by hand. More highlights come with pictures of the personal, and familial life of the master. You may visit his studio, and watch him tattoo his clients. The present selection of not previously published designs is a true rarity! Downright sensational, and unique up-to-date is a series of full-page pictures of Horikazu's clients, presenting their full body tattoos openly and with self-confidence. Total works of art of an ingenious artist, stung into the skin, lasting an eternity. 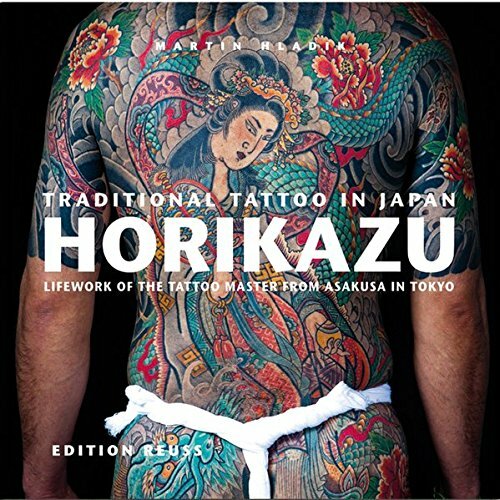 HORIKAZU is an iconographical benchmark, and contains a fully comprehensive account of traditional Japanese tattooing. The illustrious Sanja festival in Asakusa is displayed in stirring images from past and presence. Finally photographs from Horikazu's funeral reveal another aspect of Japanese tradition, whether closest friends pay their last respects to the master. Text input from qualified authors provides access to the secretive world of images of Japanese tattoo art. Tattooists, tattoo fans and any art lover will certainly be thrilled by this unrivalled illustrated book. If you have any questions about this product by Edition Reuss (D), contact us by completing and submitting the form below. If you are looking for a specif part number, please include it with your message.